The 2016 Ford F-150 is the 13th generation of the F-Series pickup in a segment that has gained strength for many years. The F-150 is the best selling in the segment and the industry notices when it does the slightest thing. The Ford F-150 will be the first large volume vehicle that will offer a full aluminum body. Every cab configuration and every inch of the inner and outer shell of the bed is made of military grade aluminum. This is reported to offer about 700 lbs of weight savings in a Super Crew model. 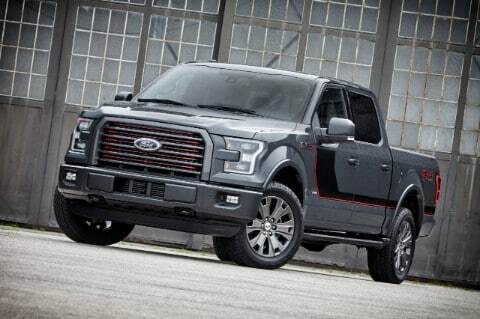 The F-150 keeps with the pronounced change in course that this line of trucks took beginning last year one favoring strong performing turbo-charged engines, adopting electric power steering throughout and steering clear of rear coil springs and air suspensions. Ford has even, at least for now, kept with tried-and-true 6-speed automatic transmissions. Instead, it's put its faith into a mostly aluminum body structure, as a way of cutting weight and boosting performance. That's almost certainly paid off. The base model engine will be a new naturally aspirated 3.5 liter V6. The next available engine will also be a naturally aspirated gas engine, but will be the carryover Coyote 5.0 liter V8. The V8 will be offered as the standard engine on select models. The two optional EcoBoost engines will include an all-new 2.7 liter twin turbo V6, as well as the familiar 3.5 liter EcoBoost engine. 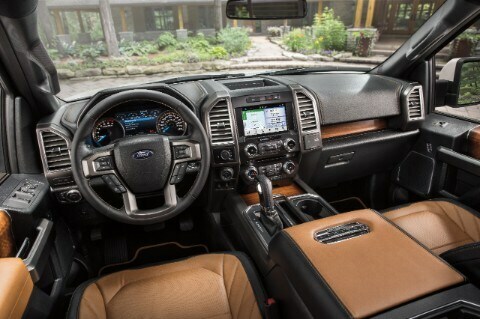 The shapes and controls all seem scaled and sized for big handed operators, with more hard buttons restored to the dash even on versions equipped with the MyFord Touch screen interface, now replaced by Sync 3 for 2016. Real wood trim and lovely leather make their way into King Ranch and Platinum models, but at first glance and touch, the Ram's Laramie Longhorn interior seems more subtly rich. Taking some tips from the Atlas concept truck of a couple of years ago, the hood is beveled to lift air up and over the flush mounted windshield and the roof, and there's even an option for a flush sliding glass window at the back of the cab. The tailgate doubles as a spoiler, and like with the headlamps and tail lamps, it is fair to keep the airflow managed as well as it can be, around such a high, bluff profile. The grille is tall and proud, and the head lamps have rectangular insets that are meant to evoke some of the earliest F-Series trucks. On some trims, they are lit by Light Emitting Diodes, a feature we expect to become standard on more trim levels in years to come. What tires should I choose for my vehicle? Do you have any specials on your services? 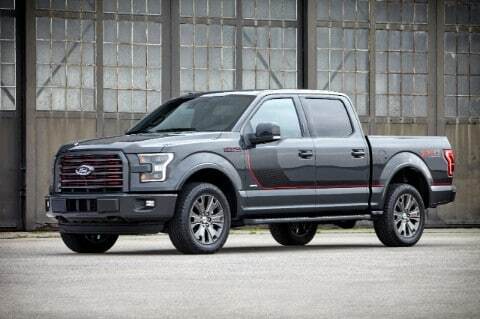 In the previous year, Ford completely redesigned the F-150, giving it an all-new body structure, including aerospace-inspired, aluminum-intensive construction and a much-bolstered list of active-safety tech. Some of the best additions are the simpler ones, though. A locking tailgate and tonneau cover turn the bed into a secure storage area. An optional set of cameras stitches together a 360º view around the F-150, for tucking it into a garage or a tight parking spot with an expert touch, and helps overcome the F-150's visibility. Give us a call today if you would like more information on the 2016 Ford F-150!